One-pot meals are my favorite kind, and this end-of-summer take on a Middle Eastern favorite is the perfect breakfast, lunch or dinner with a side of thick, crusty sourdough bread or pillowy pita loaves. We made this one in a small, 6″ Lodge pan which serves 2, but you can double the ingredients and make it nearly 6 servings in a larger pan. Preheat your oven to 425F. Heat a small cast iron skillet over a medium flame. Once warm, add 2 Tbsps olive oil (or double the amount for a larger, 14-16" pan). Cut eggplants in half lengthwise, repeating with tomatoes if you're using them. Place these face up over the oil in the pan. Sprinkle a healthy pinch of salt and 4-5 turns of a pepper mill over the vegetables, followed by the whole thyme sprigs. Nestle the garlic between the eggplant. Bake for 20 minutes, or just until the eggplants begin to brown. 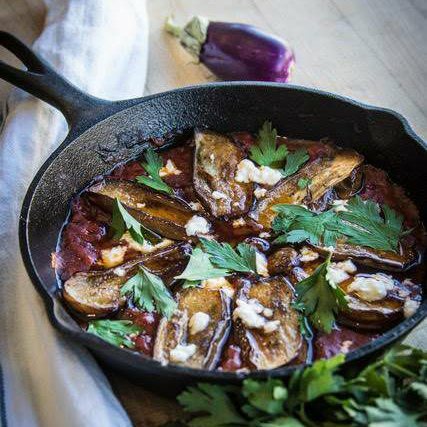 While the eggplant is baking, pour the tomatoes into a bowl. Taste and adjust seasoning with salt, pepper (basil is lovely, too). Carefully remove the pan from the oven and turn the heat down to 350F. Pour the tomatoes between the eggplant and return to the oven to bake just until the tomatoes bubble. Remove the pan from the oven and garnish with remaining olive oil, feta cheese and parsley.